Moth is a work based on the relationship between body and light. In this performance life experience and scientific experiment are melted together, like the superstition and phisic theory. 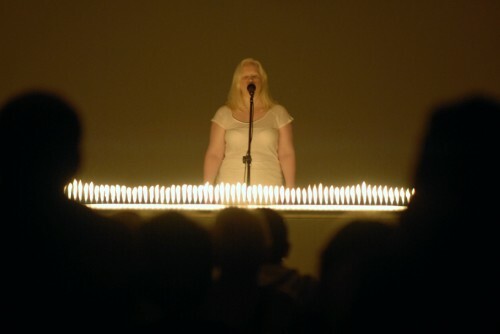 I invite a performer who has a deep body relationship with the light, an albino singer. I ask her to interact with a light source, a scientific experiment called Ruben’s tube, I push her to have control over it, to tame the flame, taking her revenge on it. The flame react on her voice moving according to her tone and volume. 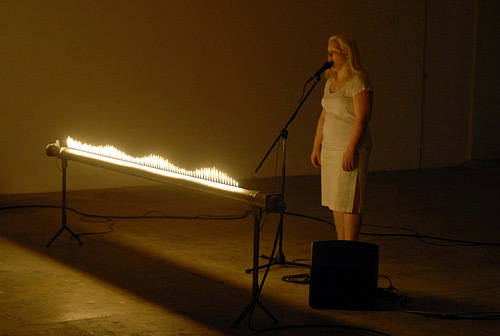 The fire coming out of the tube, represents the real soundwave of her voice. The action lasts as long as the gas inside the tube.